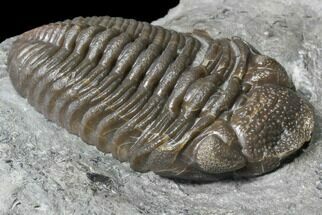 The Eldredgeops (often called Phacops) trilobites of the SIlica Formation are some of the most beautiful and sought after trilobites in North America. They used to be fairly easy to obtain but all of the collecting localities have been closed to collectors for over a decade (quarry liability reasons), so nice ones have become hard to obtain and very collectable. The chocolate brown shell, frequent pyritization and amazing eye facets add to the appeal of these trilobites.